Pros: A beautifully designed show with excellent performances and thrilling direction. Cons: A wonky back drop, right in my eye line, provided a pretty big distraction. An excellent show of cinematic proportions, with a beautiful style and a talented cast. Hardboiled takes its name from Ace in the Hole, a 1951 film noir, and the name is far from the only thing this incredibly enjoyable show takes from the genre. This 90 minute play sets out to explore some of the tropes and themes which those films utilise. The risk with that sort of endeavour is that you’ll end up mimicking, but in no way matching, the films themselves. The difference between Rhum and Clay’s production and many similar shows is that this one is warm, clever and excellently executed. Hardboiled follows Sam Shadow, a private investigator. When the glamorous wife of the local electricity baron walks into his office, asking for help to find her lover, he is immediately fascinated by the case. What unfurls is a complex web of deceit and trickery, and Sam suffers the consequences of becoming embroiled in the mess. 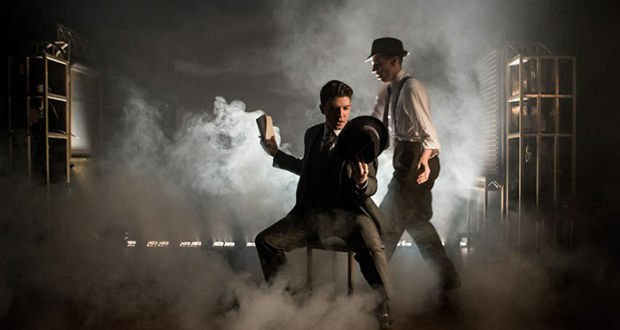 Tying together the issues surrounding fraud and corruption in modern society with the nature of film noir, this play is a pleasure to watch, whilst simultaneously forcing us to think about whether things can ever change. Formed at Lecoq, and with a style very similar to a low-key Kneehigh, it is perhaps no surprise that Rhum and Clay makes such aesthetically pleasing work. 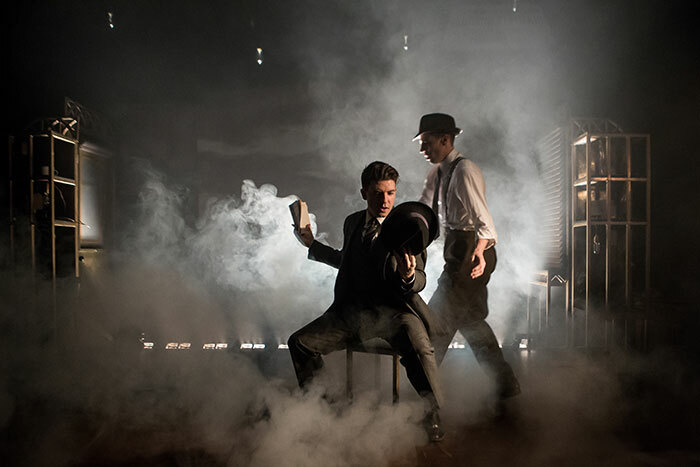 The homage to film noir is reflected in all of the design aspects of the show: the set, the costumes, the lighting – each area carefully reflects and respects the genre. You can’t talk about a film noir homage, and especially one about electricity, without taking about the lighting. From the bare, filament-style light bulbs, to the manual filters and shaping of the light by the cast, each speck of light is painted onto the stage with careful consideration. Even the cast’s movements align with it, as they smoothly and suavely slide across the stage, seamlessly moving from one guise to another. It’s not only the cast who are choreographed beautifully, but also the set, which is composed largely of small, moving pieces. The very visible transitions of these pieces from one location to another not only happen smoothly, but bring us deeper into the cinematic atmosphere of the show. The simple elegance of these transitions is perhaps clearest when we move from inside to outside buildings: with the simple change of passing a portable window from behind a table to in front of it, suddenly we are seeing this same scene from a different camera angle, a different shot. It’s so simple and yet so powerful and satisfying to see. Similarly the compulsory car chase, not frequently an endeavour successful on stage, is both humorous and highly effective – but I won’t reveal how that works, you’ll have to go see the show for that! The only criticism I would have of the set is that one of the back drops had slipped the night I saw the show, and the wonky image was pretty distracting – but I’m sure that’ll be straight again by the time anyone else sees the show. 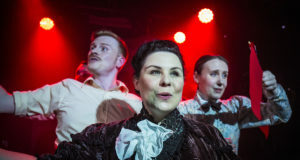 Returning to the cast to conclude my review, I can’t help but comment on Jess Mabel Jones’s outstanding performance. 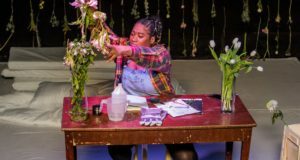 Although she is not the only member of the cast who plays several roles, she delivers a stellar performance, each new character she brings to the stage is an absolute joy to watch. She’s definitely someone I’ll be keeping an eye out for in future.